Mt. Anthony casts long shadows that keep much of the landscape to the west in shadow after sunrise. On this cold (4 degrees at 7:30) but clear winter morning, I found this scene of rolling hills shaded by Mt Anthony contrasted by the distant Taconic Mountains catching full morning sunlight. Two things about this scene made it “paintable” for me – the color and temperature contrast between the land in the shade, and the distant areas already catching the warm sunlight; and the rhythmic, abstract patterns of snow-covered open field next to forested lands. This painting was worked in a very direct manner – painting each section/shape one at time with the final color and value as much as possible. This is the type of subject that can easily fall flat – the color, value and temperature relationships have to be just right for the painting to work and to read properly. 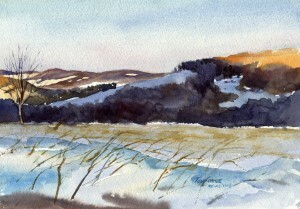 For this painting, it was the color/temperature contrast between the major shape of the hillside in the middle distance, against the more distant hills to the left and the sunlight treetops of the same hill at the middle right. Had it not been working, I would have set it aside and begun a different painting. About halfway through, I set the painting away to take a look. At that stage, the major shapes had been blocked in with color and value. Upon taking a look, it appeared that the snow covered, shadowed fields in the middle distance were a bit too light and lacking some color intensity. A wash of more cobalt blue, slightly neutralized with burnt sienna made the difference. Matted and mounted to a standard size of 11″ x 14″ for easy, low-cost framing.